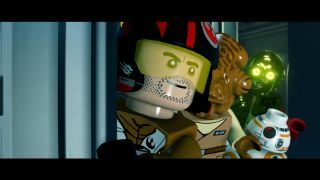 Lego Star Wars: The Force Awakens won't just be a minifigure recreation of the movie you already saw. Warner Bros. Interactive Entertainment has previously confirmed that the upcoming game will let you play through stories leading up to the events of Episode 7, and this latest trailer lets us see what new adventures it has in store. Ever wonder how all those ferocious rathtars ended up on Han Solo and Chewie's ship, or what the deal was with that red-helmeted alien in Maz Kanata's bar? Wonder no more. Best of all, all these new stories will be voiced by The Force Awakens cast members. It's basically an extended version of the movie that just happens to be way more slapstick and made out of Lego bricks. If you missed it, here's the list of Force Awakens-adjacent adventures that shows up at the end of the trailer. Lego Star Wars: The Force Awakens will be released on June 28 in the US and UK for pretty much every console released in the last decade or so. Except the original Wii, they're not doing that one any more.